How many Fadal'ers are in here? Thread: How many Fadal'ers are in here? In the last 10 years Fadals have become a pretty good staple of used machinery for start ups and folks that have more room than money or brains (Ok that last one was a stretch). Selling from free to 50K used. Fadal sold maybe 100,000 new machines in their 25 years. I wonder how many are still out there. Where I work there are still 3 chugging along next to many other types of machines. In my area Fadal was one of the more popular machine tools in the 90s. But surprisingly many are still around. So who here still has one or works somewhere that there is one still being used? Is it clapped outor had any major repairs? I have a 1996 Fadal 3016 with full Fadal 4th axis, and it’s been a great machine over the last 10 years. It’s my only non-Mazak machine, out of 7 total CNC’s. Like Bobw preaches, I’ve replaced the belleville washers and floater, thrust bearings, and bypassed the ball screw cooling crap. Only other thing I’ve had to do is replace the x-axis servo motor, as coolant had wicked into it and actually caused the magnets to come loose inside the housing! I have a 1998 3016 with a 4th axis. Looking for another one or may buy a new Hass this year. I have a 1984 Fadal VMC40. My machine service guy was chatting with a former Fadal service manager about this machine, and related to me that of the approx 300 '84 VMC40s made, 90% are still running. Apparently "you just can't kill them." I sure like mine. It was pristine when I got it and I've tried to keep it that way during the last 2 years I have run it. Not had to do much other than some very basic maintenance and replacement of a couple control cards for updated versions. Just checked the belleville washers with a drawbar force gauge and they're still all good. fairly often. The 3016 has an SMW pallet switcher, mainly for fast set up swaps, the 4020 has an aluminum sub plate, I made as it's very first job. I have a 1991 4020 with a TR65 4th/5th rotary, in retrospect in light of what they go for at auction paid way too much for it. On the other hand it's only needed bellevilles, a resolver, backup battery, and a leadscrew coupling in 3 years. After I did the backlash correctly it cuts circles/radiuses almost as cleanly as my Makino. I'd like to get a 6030 if I ever get some spare $'s. 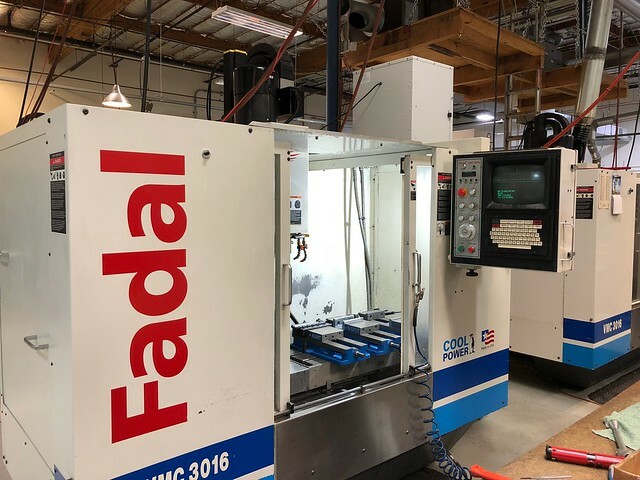 I am a Fadal fan and have a 4020,3016 and VMC40 with 4th axis and think they're great. Take a $50,000 Haas versus a $10,000 Fadal making parts. I'm thinking I have to run 1/5 the volume to break even and start making money 40,000 sooner? They are not as new looking-- and I migrated to Fadal after having 2 Haas and 2 Hurco machines on the floor(and still do). I just really like their control and the price. I'm not dying for a 1.5 second tool change, 4-6 seconds is just fine for short run low volume parts. Besides, I'm doing secondaries while its running behind me anyway. We had 13 running, producing parts as of mid 2018 - [email protected], [email protected], [email protected], [email protected], [email protected] Heavy Series; have owned a total of 15 over the years beginning 1987. Late last year sold off 2 of the 3016 (1996 & 1997) and 1 of the 4020 (2007); all in new locations producing parts. Two currently for sale (1998 3016 & 1995 4020) - making parts as of end 2018. Rest are all making parts daily or doing R&D. Range in age from R&D 3016 built in 1995/reman'ed by and purchased from Fadal in 2001, to the two 3020 Heavyweights and one 3016 purchased from the auction (in 2010 IIRC) when Fadal was closed down. I have VMC40 #26 and it sits in my garage, waiting for me to use it. I don't have a lot of money into it, but it seems like a decent machine, as much as I've used it. I hope to upgrade the electronics someday, as I took it apart and cleaned the ways, put new screws in it and refurb motors. I just need to save $$$ and decide what way to go. The Centroid route is familiar to me, but requires replacing the motors again. The NXGEN route is interesting for sure, and maintains some compatibility (not to mention the refurbed motors). The motors came off my Shizuoka in 2004 when I converted it to Centroid. They were refurbed in 1995 IIRC, or New, and didn't have many hours on them. The guy I bought the Shizuoka from was somewhat hesitant because he considered keeping it to use the motors as spares on his Fadal 3016 at the time. I like mine, probably will never sell it, it doesn't take up a lot of space, and I *LIKE* the bed mill style for doing oddball stuff. We have a 1992 4020HT that was upgraded to a -5 control at some point. For what we paid it certainly doesn't owe me anything. Always have an eyeball out for a cheap close 6030 for the odd part that's too big. The appeal is they are decent, cheap and parts are cheap and easy to get. The control is exteremely easy to use. They're slow. Getting a Fadal is about capability, not throughput. Sometimes you need one. Sometimes you need the other. Sometimes you need both. I just bought a 4020HT with a Calmotion 4th axis extended Z and rigid tapping. I replaced the way wipers and way cover wipers. It's not as easy of a conversational control as the Dynapath on my tree 310. I had the manuals printed by Staples as my home printer wouldn't print the bottom of the pages. Thanks to everyone that has answered my questions so far. A past life, but this fits nicely with the thread. We had a FADAL temporarily located not far from a Haas. When the Haas service man was in, one of the guys asked "What do you think of [pointing to the FADAL] those?" The service man grumbled, "Can't kill the stupid things." For the records, just posted as to the old FADALs, not to knock Haas. I've no idea about the new FADALs either. I have a 94 4020 retrofitted with a Dynomotion Kflop controller. Use this machine nearly everyday in my small shop. Added a Yuasa 4th axis. New controller does rigid tapping, controls toolchanger, has handheld mpg, modern looking LCD display, usb etc. Really happy with machine and controller. I bought one of the 3016s from Fred. I love it. It's exactly what I needed. It's hard to beat for a garage machine or someone that needs to hit the ground running making parts and doesn't want a sizable monthly payment. While I do think there are benefits to a brand new machine and if ran a business making specific products and already had a solid customer base, I would probably buy new, but I also live in Southern California and go into businesses all day for my job. I can honestly say, probably 80% of machine shops or shops that manufacture have at least one Fadal, if not multiples. There are plenty of shops I go into that just have them cranking out parts. I think they are fantastic machines for the money. If you just want something that relatively easy to use, makes good parts and can be serviced, they are hard to beat. I bought the machine, three 17.5 Orange vises, a bunch of Maritool holders and some other stuff and still spent the same or less than what a loaded out Tormach costs. I started with a full size machine and skipped the bench top/Tormach all together and I'm glad I did. My only regret is not buying the Fadal first. I try to learn on the daily, but I've never worked in a machine shop. I'm entirely self-taught. I have made a few friends over the years that are machinists and help me with oddball questions, along with reading on here, videos or anything else I can get information from. Some works, some doesn't, but it's no different than any other field. Yes, they fit in a standard garage door and yes, it will run on a RPC. It's a little extra cost for power/phase conversion/moving, but I think it's definitely worth it. Creampuff was too hard to pass up on the for sale pic alone. Working out the deal with Fred and his other coworkers made it as easy as it could possibly be. I've had mine almost 3 years now. I paid $7500 for it with a bunch of holders and a nice Kurt 8". I've only had to replace a drive amp and the CPU board. The machine has paid for itself many times over. We run one as a dedicated placard maker, I fitted a 5 to 1 overdrive unit for engraving on it to keep the spindle rpm down and up productivity.